The forecast with snow and sleet is looking nasty this afternoon and evening. That means afternoon school isn’t the only thing being cancelled in Town. Update (2/12/19 2:58 pm): The Food Pantry will also be closed tonight. I’m keeping this post pinned to the top with the latest updates up front. Other news and events will run below this today. Town Offices and the Library will close at 2:00 pm today. That means that the Advisory and Board of Selectmen meetings will also be cancelled for this evening and the backup meetings scheduled for Wednesday night will replace them. Expect it to also mean that the Senior Center is closing early. And I’d say it’s safe to assume that most local activities, practices, etc. will follow suit. The Library may be closing early today. Those details are still pending, so look for an update later. In the meantime, they have announced that the Poetry meeting is cancelled and the 6th-8th grade book club is rescheduled to February 26th. The Town has yet to announce any early closures. Two Committees prepared for the possibility by giving public notice of a potential Joint Advisory and Board of Selectmen meeting on Wednesday night. It is a backup to replace tonight’s joint meeting if they have to cancel it. Fay School has rescheduled its workshop “Your Parent Toolbox: Fostering Language and Literacy in the Early Years” to February 26th. Are you prepared for today’s winter weather? The afternoon into evening commute is going to be a mess. If you can, please stay off the roads. This will be a high-impact event w/ slowed commutes, long drive homes, slick roads as moderate to heavy snow / sleet impacts the area. Winter storm warnings & advisories posted. Significant impacts for today’s afternoon into evening commute. If you can, stay home, stay off the roads, today is going to be a mess as moderate to heavy snow / sleet of @ 1″/hr hits our area beginning @ noon. Storm total snow & ice posted below along w/ onset & end times. Across the interior, snow transitioning to sleet before mixing over & changing to rain … along the coast, snow to sleet to rain. Travel mess. 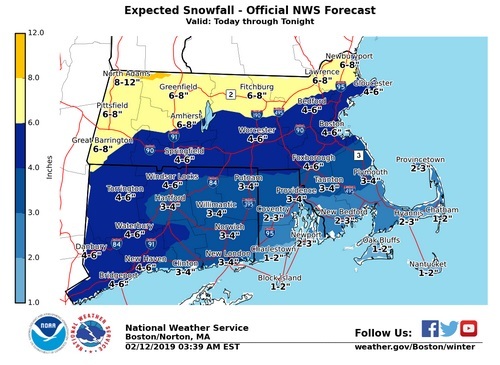 They have forecast 4-6″ of snow for Southborough. It’s likely to start by around 1:00 pm though lower chance of starting closer to 11:00 am. NWS expects our town to get rain, freezing rain, and sleet overnight with some icing in the morning. Precipitation is expected to end around 5:00 or 6:00 am tomorrow (with a slight chance of rain/sleet continuing a couple hours longer). Any idea if the food pantry will be open tonight? Good question – I forgot that Tues evening is one of their two weekly opening times. Unfortunately, they will be closed. They shared that news on Facebook earlier today.